The lack of parking space for two wheelers at the Central Bus stand is causing a lot of adversity to the commuters. 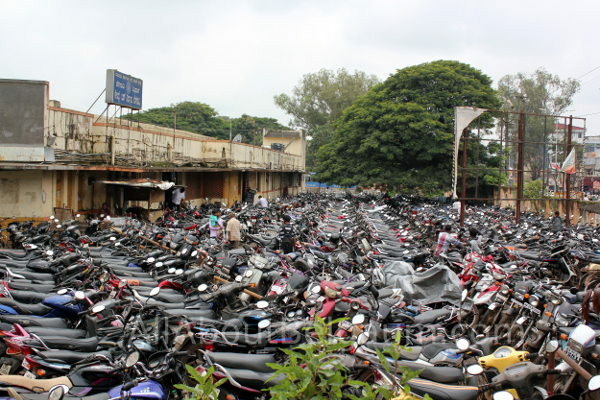 Chaos rules the two-wheeler parking lot in Belgaum central bus stand with the number of vehicles growing rapidly. It is common to see riders, unable to take out their vehicles, fighting with the attendants because of haphazard parking. People coming from all over the city who travel for work to various nearby places park their vehicles here in the morning and collect the same after work. People prefer to park their two wheelers at CBT as it saves them money, or else they will have to shell a lot more daily for the Auto as the public transport system is not proper and is not timely, a few commuters told this blog. What about the new bus stand to be built with proper parking ? Will it ever happen. Hubli, Dharwad, Davangere,Shimoga, Raichur, Bijapur, Bagalkot, Gulbarga,to name some district places and some small places like kittur and many more have got new bus stands. if corporation builds multi-level car parking at CBT and railway station..that will give income to corporation as well and reduce congestion outside the stands.